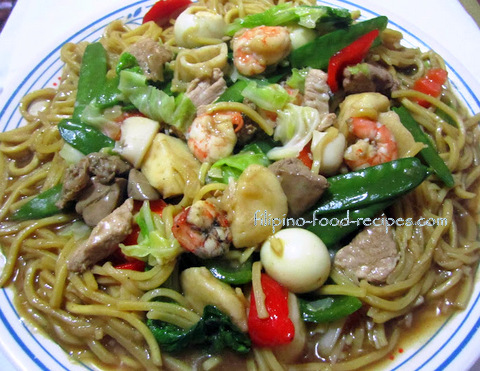 This recipe is my version of my favorite Pancit Canton Chinese Style from Maxim's restaurant, which is a cross between pancit canton and chopsuey. Ideally, this would be perfect served on a special occasion because it has a ton of ingredients, ranging from chicken, to seafoods, vegetables and a very thick, rich sauce, which feels like eating pancit and chopsuey. However, you could put together any left-over uncooked meat and mild-tasting vegetables in your refrigerator, saute them real fast and serve as dinner any day of the week. 1 Saute onion and garlic in oil. 2 Put in the meat and seafood ingredients and saute for 2 minute. 3 Add the vegetables and oyster sauce and cook for a minute. 4 Add just a a cup of chicken broth and bring to a boil, then add the quail eggs and half of the cornstarch slurry to thicken the sauce. 5 Remove the meat and the vegetables from the pan, leaving just the sauce. 6 Add the water, chicken broth, Knorr cubes, soy sauce and pepper, and bring to a boil. 7 Stir in the noodles and let it simmer until the sauce is reduced and absorbed by the noodles. 8 Put the rest of the cornstarch slurry to thicken the sauce, and drizzle the sesame oil. 9 Arrange on a platter and put the meat, vegetables and quail eggs on top. 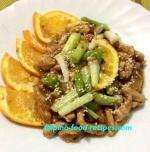 10 Serve with lemon or calamansi slices.